Virginia No-Till Alliance – Maximize farm productivity and profitability by promoting the successful implementation of continuous no-till systems through shared ideas, technology, conservation and education. You must attend a new 2019 training program if you intend to use the new low volatile dicamba products (XtendiMax, Engenia, or FeXapan) in 2019. Click here for the online registration link for the February 5th session. Jim Hershey, along with his wife Shirl and son Marc & Crystal, own and operate their 500 acre crop and livestock farm in Elizabethtown, Lancaster County Pa. Hershey’s operation includes Organic Certified Broiler Chickens, Swine wean to finish facility , Crop Management Service & Harvest View Barn Wedding venue. Crops include corn, wheat and soybeans all of which are managed in a No-Till /Cover Crop environment. Mr. Hershey has been planting into green living cover for more than 5 years and has seen a significant improvement in the soils ability to handle drought and excessive wet conditions. Hershey has also been doing cover crop interseeding for 4 years and is now marketing interseeders commericially. Jim is also President of the Pennsylvania No-Till Alliance and has been speaking to many farmers and agri-business folks across Pennsylvania and surrounding states promoting No-Till, Cover Crops & Soil Health. Chris Lawrence has served as State Cropland Agronomist for USDA’s Natural Resources Conservation Service (NRCS) in Virginia since 2004. 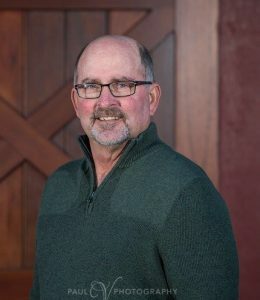 He provides state-wide technical training and direct assistance to NRCS field staff, public- and private-sector partners, and farmer clients on topics including soil health/soil quality, erosion prediction & prevention, cover crops, and nutrient management. Prior to joining NRCS, Chris served as an agricultural Extension Agent for five years in the Shenandoah Valley and northern Coastal Plain regions of Virginia. Chris earned his Master’s degree in Crop and Soil Environmental Sciences from Virginia Tech in 2000. 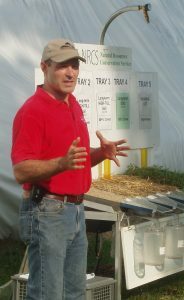 He is a Certified Crop Advisor (CCA) and a Certified Virginia Nutrient Management Planner. Chris’ love for the soil and agriculture can be traced back to his grandfather’s dairy and crop farm in French-speaking Switzerland, where Chris lived as a child and where he worked every summer until the age of 20. 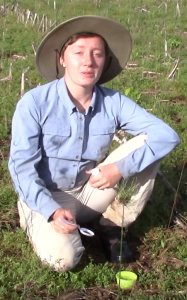 Kirsten Brichler is a Master’s student at Virginia Tech studying entomology. She is conducting field research in the Shenandoah Valley under the direction of Dr. Sally Taylor. The goal of her project is to determine the effects of field crop management practices on slugs and slug predators. Kirsten will share the results from her first year of field observations. © 2019 Virginia No-Till Alliance.